Hundreds of spectators lined the beach and gasped. They cheered and clapped. They did this while watching bodysurfers brave 15-foot waves at The Wedge. It's a Newport Beach, California break along the Pacific coast. The area is known for its powerful waves. The thrill of challenging the walls of churning water had lured bodysurfer Robin Mohr. He had gotten out of bed before sunrise. Now he was panting on the sand. A wave had sent him tumbling through the foamy chop. A trickle of blood was on his forehead. That's where he'd been smacked by a surfboard earlier in the day. "You're just super-alert to where you're positioned. Because the worst-case scenario is you land with your head on the sand," said Mohr, 50. He's South African. He had driven from San Diego to Newport Beach. Big surf has been pounding south-facing sections of the Southern California coast since May 3. It has kept lifeguards busy. The surf has attracted daring surfers and bodysurfers. They arrive with boards, wetsuits and fins in tow. The big surf was created by a major storm thousands of miles away. The highest California surf was expected the next day, May 4. It was being kicked up by the Southern Hemisphere storm. Six- to 8-foot waves were recorded at Santa Monica. Neighboring Venice saw slightly higher surf. The Behr family from Colorado brought their sons, 1-year-old Cole and 3-year-old Max. Their father, David Behr, called the huge surf a once-in-a-lifetime experience. "We've been to Hawaii a few times. And whenever you can catch some big waves, just watching it is incredible," he said. All the while, he snapped pictures and pointed out extra-big waves to his younger son. Newport Beach saw 55,000 visitors over the weekend. Even so, more lifeguards were on duty Monday, May 4. It was because of the high surf, said Newport Beach Chief Lifeguard Rob Williams. The rough conditions extended north along the California coast. They went up to San Luis Obispo County. Avalon, Port San Luis, San Simeon and Cayucos could see currents capable of dislodging moored vessels and docks. "Inexperienced swimmers should definitely stay out of the water," said Sgt. Ron LaVelle said. He is with the Seal Beach police department. Lifeguards pulled 17 people out of the water over the May 2-3 weekend off Newport Beach. It was the busiest weekend for lifeguards since March. That's when 134 people were rescued. It was during a weekend of big waves and warm weather. Critical thinking challenge: Why would conditions vary from city to city? This story is about surfs up crowds floock to calafornia beaches . I would like to see pepole surfing on the beach with wetsuits and surf boards . Thier was 6-8 foot waves on the calafornia coast . It would be fun to see them on the water surfing and having a great time. I want to live in calafornia and go to the beach and swim on the ocean water . This will be very fun and dangerous because it is very fun to surf on very huge waves and also very dangerous because if you fall down like how Robin Mohr did then you don't know what accidents you might get into like bleeding from your head or your bones getting broken. A lot of people did come to the Newport Beach and a lot of people did get rescued by the coast guards because little people shouldn't play near beaches that has big waves. This passage was vary interning. It was fun to read this. I did not know that in Sand Dago that waves can go up to 8 feet high. I loved this article.I love this article because i chose this article in class. I also love the article because i love watching people surf and I love surfing by my self. In fact id rather read this article than a princess article. I liked this story because i know a lot of people that surf. I love surfing at the beach. I like the people that challenge themselves to very very big waves. There are many pictures that i look at of cool people that are in the middle of surfing a big wave. Wow! I think that the surfer is really amazing. It is very amazing because that wave is really big and really high. I've never really seen people surf before in real life. I also think that it is amazing because it is kind of like a world record, and I think that it may be impossible to do, except for that surfer. Anyways, I think the lifeguards are trying to just be on the safe side, because they are life-guards. Well, there must have been millions of lifeguards there because that wave is huge, and they might be worried about the surfer. 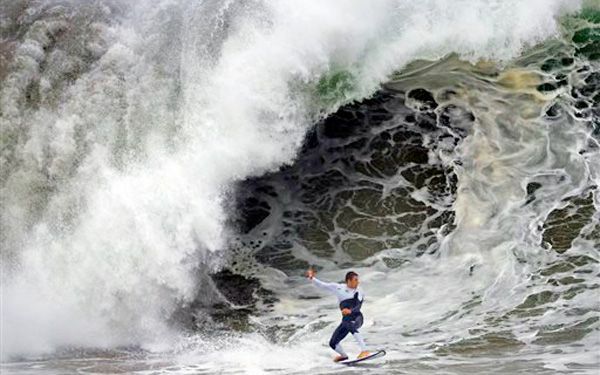 I think that it is amazing that such a person can surf like that. I have not tried surfing before, and I don't think I'd be good at it. And waves this big must be really powerful! Who would want to surf those when they know something like what robin Mohr said? That surfing might be dangerous but fun. The life guard must be busy because what if the surfing guy gets hurt. If I was surfing competition I will not do it because it is a dangerous thing to do. I might be dead. Also that wave was so big!